I bumped into two cool websites. With one easy step on one simple website, you can completely send free text message free of charge. txtDrop.com enables users in United States and Canada to send text messages with instant delivery. Their goal is to deliver a web based free text messaging and as easy as possible. txtDrop.com developed an alternative website txtDrop.net for international users. Again, they set out to make it a web based free text messaging while keeping it as easy as possible. Wonder how you can stay connected with any of your instant messaging almost anywhere. Now, you need a computer with a web browser only. With eBuddy, Kool IM and meebo, you can now chat online almost anywhere anytime. No download. No installation. No upgrade. Its free. eBuddy supports MSN, Yahoo and AIM. Kool IM supports AIM, MSN, Yahoo, Google Talk, and ICQ. 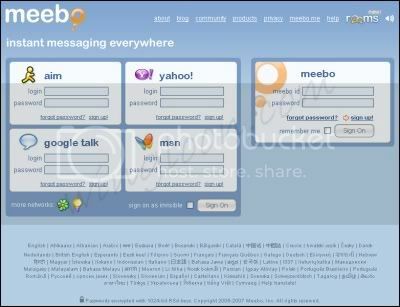 meebo supports AIM, Yahoo, Google Talk and MSN. Send unlimited free SMS now with mobiK from your PC. You need to register as member to send a free SMS. Only members can send and receive SMS within each other anywhere, anything and with no limit.